Round 5 of for our V8 Supercars Championship takes us to our second round in the sunshine state. This time up to Townsville. We should see lots of curb hopping, door banging, close action at this classic parklands track! 1x 35 laps (100km) feature race, one compulsory pit stop including ding mandatory 4x tyres changed, grids based off race 1 results with top 6 reversed. A couple of things regarding this track. If you run wide at turn 5 (the fast right handier) you will get a cut track. IF you keep 2 wheels inside the green line you wont get penalized. Pit entry will need to be practiced, See Mikes post Below for details. I've attached an image of the pit entry speed limit line. It's very easy to miss the line and to get a penalty. 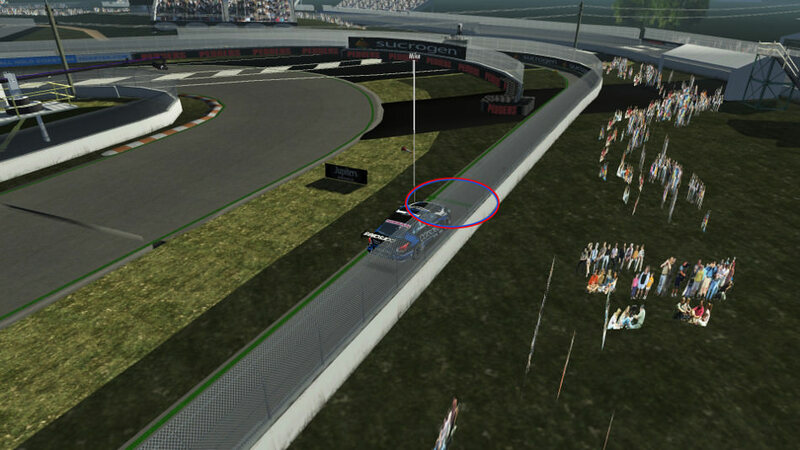 Also, be aware this pit entry lane is incredibly narrow, you will need to practice entry. I really enjoyed last night, once you get into a rhythm the track has a really nice flow. It seems that the game issued me 4 stop/go penalties at once for spinning across the grass in the second left/right chicane. That's why clearing the penalty (by Mike) had no effect as I still had 3 left...... so I spend 3 laps doing 3 Stop/Go penalties!